For all my fellow Pistachio Lovers out there, this one is for YOU! 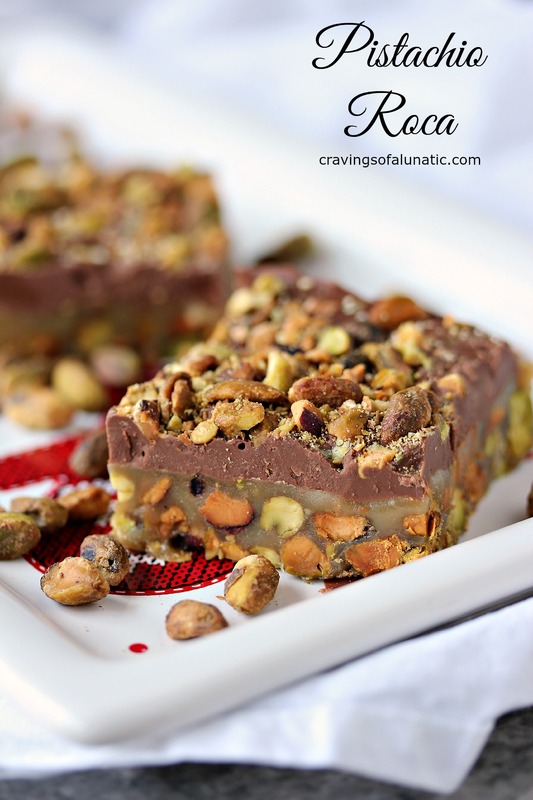 It’s Pistachio Roca, layers of pistachios, caramel, chocolate, and more pistachios. It’s little bites of candy heaven! Welcome to Day 4 of Christmas Week. This annual event was started was something I started way back in 2012. This year we have over 35 bloggers sharing festive sweet recipes for the event. Plus we all chipped in for a huge Amazon Gift Card Giveaway. Okay, okay, I’ll admit it. I’m a pistachio nut. In every sense of the word. I cannot help myself. It’s nature’s perfect nut. I love them immensely. My love for pistachios knows no bounds. 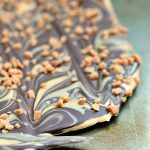 Whether I’m whipping up Marble Bark with Pistachios and Fleur de Sel, Microwave Pistachio Brittle, or Cherry and Pistachio No Bake Cheesecake with Animal Cracker Crust, I’m a happy girl. Working pistachios into recipes makes me happy. I even have a post that teaches you how to toast pistachios. Toasting them brings out their flavour more intensely. You need to try it. So yes, I LOVE pistachios. It’s no secret I snack on them at night. I love having a small bowl of pistachios while I watch TV. It’s my version of nightcap. Or milk and cookies. It relaxes me. 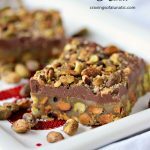 I originally planned to make Almond Roca, but I went on a baking spree yesterday and had a giant bag of pistachios handy so I went to town and made 1,009,367 pistachios recipes. For all my fellow Pistachio Lovers out there, this one is for YOU! 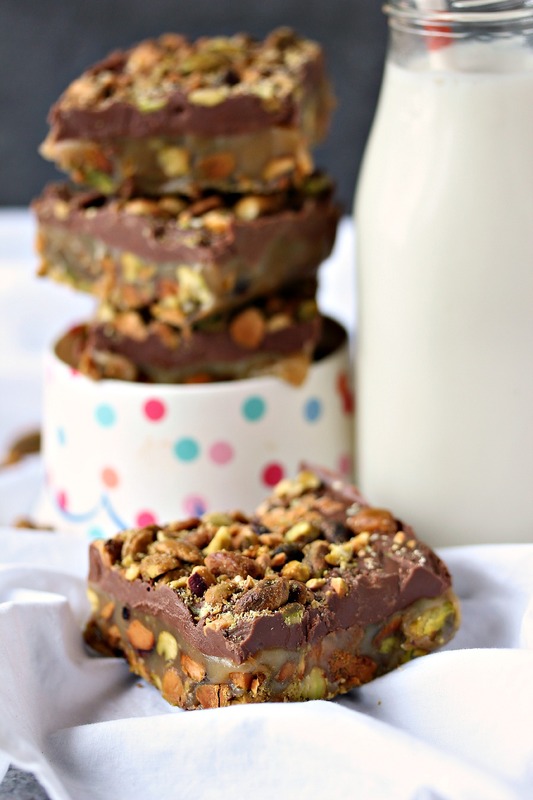 It's Pistachio Roca, layers of pistachios, caramel, chocolate, and more pistachios. It's little bites of candy heaven! Butter a 11 x 7 baking pan. Place a medium size saucepan melt the butter and brown sugar over medium-low heat. Allow the butter to melt and the sugar to start to cook while stirring occasionally for about 3 minutes. Now allow it to bubble without stirring until it turns amber in colour. You want it at a low boil, so it's just bubbling lightly across the pan at a medium pace, not too slow and not fast. Allow it to bubble and cook until it starts to turn amber or golden in colour, you can swirl the pan here and there during the process if you like but don't stir it..Some folks use a candy thermometer, I do it by eye. It can go from amber to burnt quickly so don't walk away or turn it up. You want to watch it pretty closely. 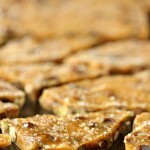 If it's bubbling nicely it should take about 3 to 5 minutes to begin to thicken and turn into a caramel mixture. While the caramel mixture is bubbling you can toss 2 cups of roughly chopped pistachios on the bottom of the buttered 11 x 7 pan. Once the caramel mixture is thick and amber in colour remove from heat, stir and pour over the pistachios in the 11 x 7 pan. Allow to cool slightly. In a double boiler, or microwave, melt the chocolate. I like using milk chocolate for all my candy. We like the taste better than other chocolates. You can use dark if you like. I use the double boiler for melting my chocolate more often than not. If you don't like doing that you can melt it in the microwave for about 1 to 1 1/2 minutes. If I melt chocolate in the microwave I tend to add a tiny bit of canola or vegetable oil to it. Just about a teaspoon for this amount. I find chocolate seizes too easily in the microwave so adding a bit of oil helps keep it smooth. Microwaves are all so different so time can vary dramatically. Once the chocolate is melted pour it over top of the caramel mixture in the pan. Smooth out with a spoon. 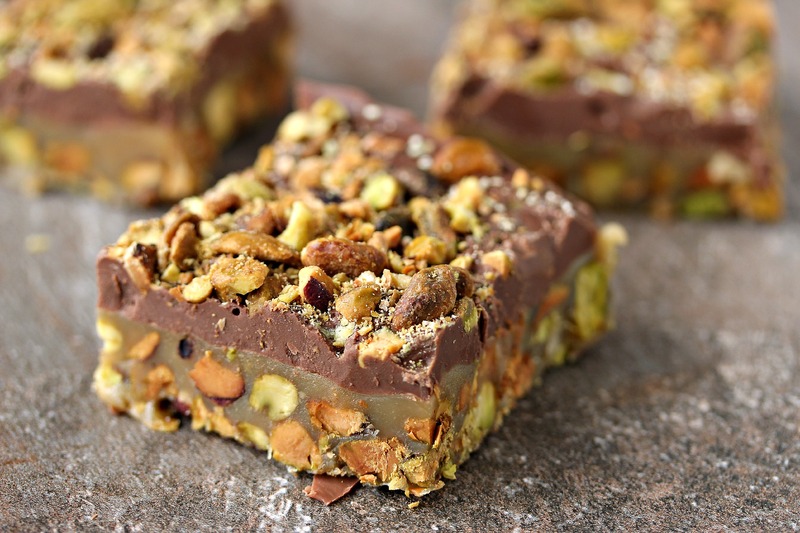 Toss crushed pistachios over top of the chocolate evenly. Place pan in the fridge for about 30 to 60 minutes, or until ready to serve. Cut into squares in the pan. Serve with a big old pistachio loving smile! PIN THIS TO YOUR FAVORITE DESSERT BOARD! So, all us bloggers participating in Christmas Week chipped in the funds to host an amazing Amazon Gift Card Giveaway. We’re giving away 3 Prizes. 1st Prize is a $500 Amazon Gift Card for 1 lucky winner. 2nd Prize is a $250 Amazon Gift Card for 1 lucky winner. And 3rd Prize is a $50 Amazon Gift Card for 1 lucky winner. Giveaway will run from December 7, 2015 to December 26, 2015. GIVEAWAY IS CLOSED! 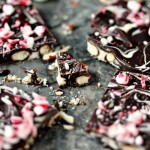 If you’re looking for more chocolate recipes be sure to check out my recipe index. 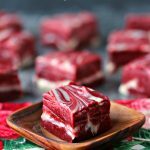 You can also find a lot more Christmas recipes as well. I’ve only recently started eating pistachios—why did I ignore them for so long? Now they’ve ousted ever other nut from the top spot—they’re fabulous just plain, but with caramel and chocolate? Heavenly!!! whoa. I might have to try these. AJ loves loves LOVES pistachios! I think my favorite will now be this!! We love the store bought stuff, but this looks SO MUCH better! I’ll have to share this with my brother-in-law! He loves baking with pistachio! Thanks so much for this recipe! I’ll have to share this with my brother-in-law! He loves baking with pistachio! Thank you so much for sharing this recipe! I love to make iced sugar cookies! I love sugar cookies too. 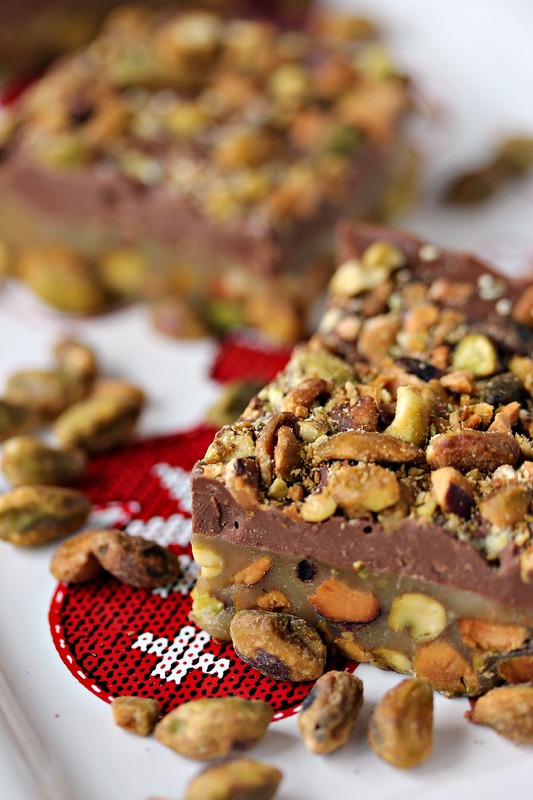 Pistachios are my favorite and I love how festive and versatile they are! These bars look amazing! I used to buy bags of pistachios in the shell from the grocery store, but I’ve gotten lazy and now buy BIG bags of shelled ‘stachios from Costco. They are good thrown on a salad or for snacking. 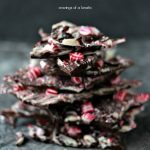 I so rarely think pistachios with sweets, though, and I really like your ChristmasWeek recipes for making me rethink that. I’m a sucker for dark chocolate, so I’ll have to try this that way. 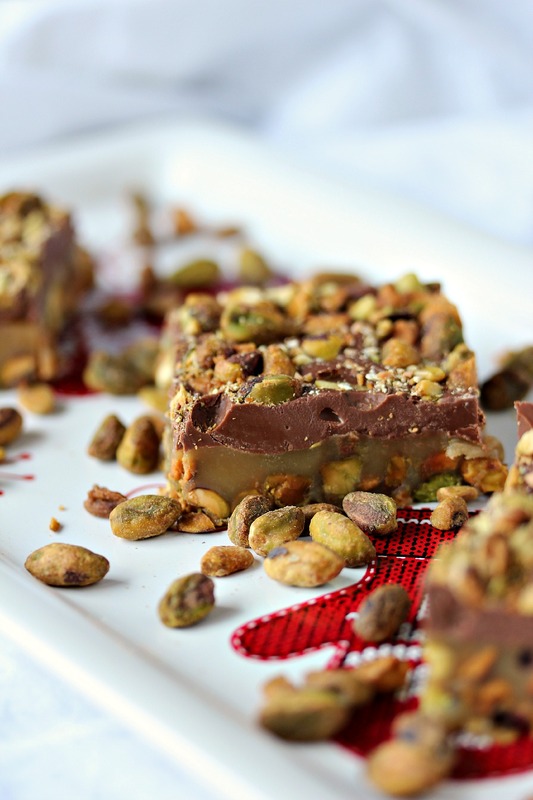 Kim, You’re killing me with these pistachio recipes. 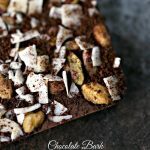 I was all set to start off with the pistachio toffee, but now you’ve gone and made pistachio roca (almond roca is amazing, so I’m betting this is amazing to the second power or maybe the tenth) – going to the closet to get my stretch pants.